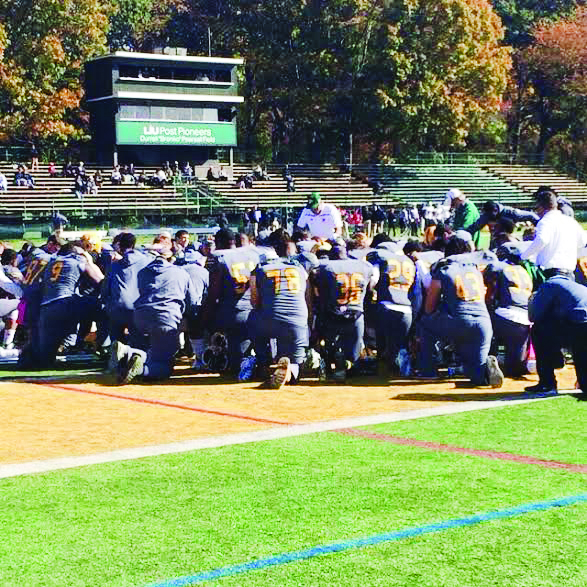 After giving up 22 unanswered points in the fourth quarter, the football team (6-3) held on and defeated Northeast-10 opponent, Southern Connecticut State University (3-6), 49-46 on Senior Day at Bethpage Federal Credit Union Stadium. With just 16 seconds remaining in the contest, junior quarterback Jeff Kidd put the game in the books with a first-down pass to red-shirt sophomore wide receiver James Higgins on a crucial fourth-and-three. 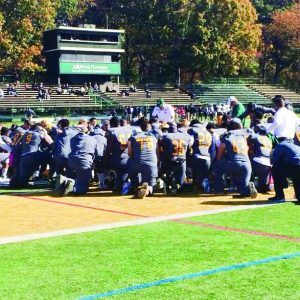 The game was highlighted by Kidd’s season-high six touchdown passes as the LIU offense proved to be unstoppable throughout the first three quarters. Two snaps into the second period, Kidd delivered a 19- yard touchdown pass to red-shirt sophomore wide-out Kyle Ward, put- ting the hosts in front, 14-7. On the following drive, junior running back David White dashed for 23 yards into Owls territory, before a personal foul on the defense put the Pioneers in the red-zone. The next play resulted in a 13-yard touch- down as Kidd found senior tight end Sean Binckes, giving the Pioneers a 21-7 advantage. LIU’s onslaught continued for the third straight series as Kidd rifled a bullet to Higgins, which set up shop at the Owls’ 37-yard line. He then hoisted a 37-yard bomb, which was hauled in by red-shirt junior wide-out Shane Hubbard for the score. Kidd threw three touchdowns in a span of 4:28, giving the Green and Gold a commanding 28-7 lead. Southern Connecticut tacked on a field goal, but the Oregon- native kept on rolling as he scrambled for 41 yards down to the Owls 23- yard line. Three plays later, Kidd found Ward up the seam for an 18-yard touchdown in the back of the end zone to put LIU ahead 35-10 heading into the locker room. to Hubbard, scoring his second touchdown of the game. The Pioneers jumped out to a 42-17 lead, but the defense started to lose its footing when Owls quarterback Robert Nittolo threw a 19-yard touchdown pass to junior receiver Devante Jenkins, making it a 42-24 game. As the third quarter came to a close, Kidd continued to throw for big chunks of yardage, hooking up with Binckes and then red-shirt junior running back Mike Williams giving the Pioneers a first and goal from the Owls 2-yard line. On the next play, Kidd would find Williams again on an out route for a two-yard score to close out the third quarter. A fourth quarter, which was filled with injuries and miscues, nearly cost the Green and Gold the game. The Owls scored three touchdowns in the final period putting the crowd on the edge of their seats. After Jenkins scored his second touchdown of the game for the visitors, the Pioneers turned the ball over as Higgins coughed up the football. The visitors capitalized when senior running back Robert Thomas scampered into the end zone from three yards out, bringing the Owls within 11 at the 7:52 mark. In addition to red-shirt senior linebacker Brandon Cheney missing his third straight game, the Pioneers lost junior safety Clarence Sears in the third quarter due to injury, leaving them thin in the secondary. With Sears sidelined, the guests continued to gain momentum as they got the ball back and scored with 3:35 remaining, cutting LIU’s lead down to three following a two-point conversion. On the ensuing kickoff, red-shirt sophomore defensive back Mike Gregorovic recovered a squib kick to give LIU possession. From that point on, the Pioneers were able to chew down the clock and escape with a 49-46 victory. Kidd completed 19-of-27 passing for 282 yards and a season- best six touchdowns. In addition to Kidd’s outstanding performance, the Pioneers rushed for 260 yards and racked up 542 yards of total offense. White ran for a career-high 185 yards on 26 carries. Kidd also showed his mobility on the ground with six carries for 58 yards. Binckes had four catches for 67 yards and one touchdown. Williams served as a nice check-down option out of the backfield, making four receptions for 58 yards and one score. Ward and Higgins each caught four balls for 48 yards. Defensively, the Pioneers missed the presence of Cheney and Sears late in the game, but did enough to secure the win. Junior line- backer Nate Feliz led the defense with a career-high 14 tackles. Red-shirt junior defensive lineman Kenny Scotland and sophomore defensive lineman Kevin Petit-Frere were fierce off the edges, each recording two sacks. Scotland led the squad with four quarterback hurries while Feliz and Petit-Frere each had two. Head Coach Bryan Collins and the Pioneers will wrap up the 2015 regular season Saturday, Nov. 7, when they take on Northeast-10 rival Bentley University in Waltham, Mass. Kickoff is scheduled for 1 p.m.